Small black seeds from the Vaccaria plant are secured on the ear with a piece of adhesive tape over specific acupuncture points. The seeds stimulate the point by exerting mild pressure. 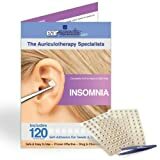 Auriculotherapy with ear seeds or with acupuncture has been known for centuries in traditional Chinese medicine to help alleviate insomnia and fitful sleep. It also has been known to bring the whole body into balance and relaxation so you can start sleeping better. Alleviate your insomnia with our non-invasive self-help acupressure ear seed product that's a natural, holistic, and affordable sleep aid! Ear seeds, it's like reflexology for the ears! Also known as acupuncture ear seeds, beads, or pellets.